The French designer and architect Marc Held has worked across various media, forms, and dimensions, from teapots to automobiles, and wristwatches to cruise ship interiors. His intrigue with the possibilities of kinetics in furniture design drove him to develop the “Culbuto” furniture series in 1967. Made up of a low-back armchair, a high-back armchair and the stool seen here, these pieces were the first French-designed seating forms to be manufactured by Knoll. With a low center of gravity and a curved base, the construction of these pieces encourages their sitters to keep in constant motion. The name “Culbuto” references a round-bottomed wooden figurine, a roly-poly toy, which always returns to an upright position when jostled. During his design research phase, Held sat in Arne Jacobsen’s Egg chair whose rounded form and scooped-out seat inspired the profile of this playful series. 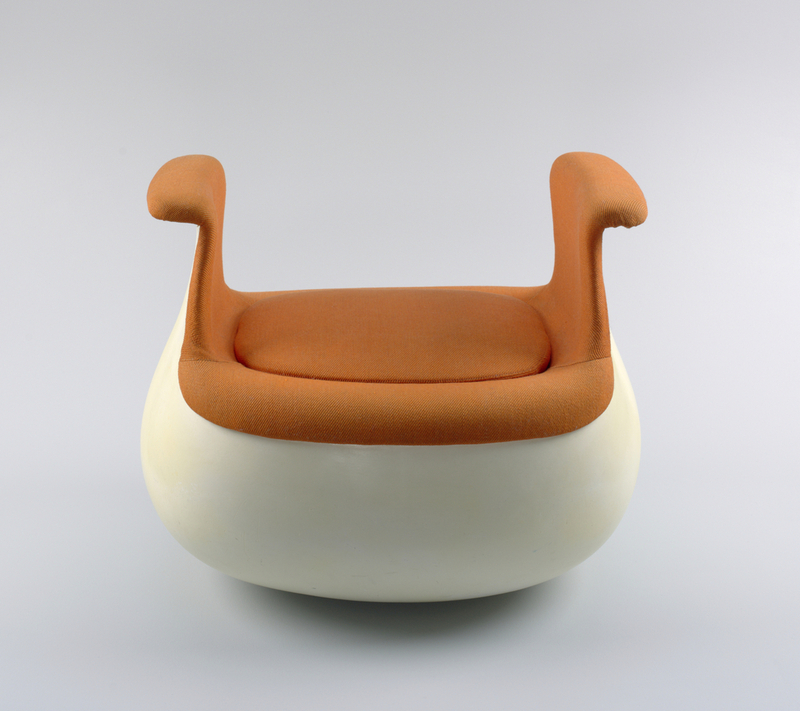 This object’s bulbous physique and bright orange upholstery speak to the optimism and boldness that characterized design of the 1960s and 1970s. This stool is one of over sixty stools that comprise the Linda and Irwin R. Berman Stool Collection. This object was recently digitized as part of Cooper Hewitt’s project to photograph the museum’s more than 210,000 works in the permanent collection. View all recently photographed objects. ← Fighting in the Dining Room? Culbuto Rocking Stool; 1967; Designed by Mark Held (French, born 1932); Manufactured by Knoll (New York, NY USA); Molded fiberglass, woven wool upholstery; The Linda and Irwin R. Berman Stool Collection, 2013-50-28-a,b.